Manowarriors, your calls have been heard! 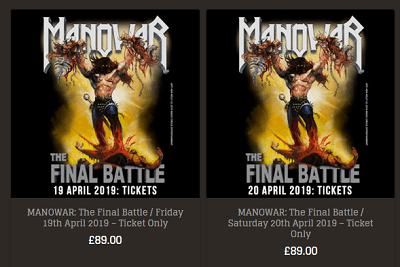 MANOWAR will perform not one but two shows on their FINAL BATTLE 2019 World Tour on UK ground! What better city to perform these two exclusive shows than the birthplace of British Metal itself. Tickets are on sale at www.hrh.live priced at £89 each!! MANOWAR´s influence in the Rock Music industry is undeniable. During their impressive career, they have left their mark in the Heavy Metal genre thanks to a combination of unique craftsmanship and characteristic songwriting. With unrivaled conviction, persistence, and the unfaltering courage to always do things their own way, the band has weathered even the most unconquerable challenges. In an age of casting show “talents” and flimsy one-hit-wonders this band gives their fans what they love them for: the massive, powerful soundtrack of their lives, songs that celebrate the audacity of the individual and the spirit of the community. Follow MANOWAR on Facebook (https://www.facebook.com/manowar) , Twitter (http://www.twitter.com/manowar) , Instagram (http://www.instagram.com/manowarband_official) and manowar.com for all tour dates and constant updates.